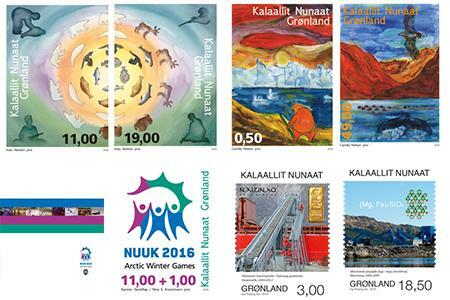 On Monday, 19th January, TELEPOST Greenland will issue the first seven stamps in 2015. The two stamps complete Ivalo Abelsen’s artistic interpretation highlighting the cultural importance of hunting within Greenland. As in the case of the first two stamps in the series, these two stamps may also be positioned together so that the animals and the colors fit together to make a cohesive pattern. Since the first immigrants arrived in Thule between 4,000-5,000 years ago, the Inuit in Greenland have been dependent on natural resources such as fish, birds, land and marine mammals. Hunting and fishing have always been a matter of survival in a country where the summer is short and the winter long and hard. The last two stamps in Ina Rosing’s colourful series showcasing Greenland’s mining history. Like always, the mining stamps will be issued in self-adhesive format. Click here for more information about Greenlandic stamps: http://www.stamps.gl/en and http://www.facebook.com/stamps.gl .